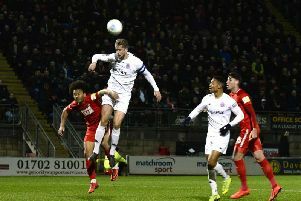 AFC Fylde manager Dave Challinor is confident the narrow margins will start to favour his side on their travels if they remain so difficult to beat. Challinor’s Coasters are unbeaten in eight games on the road but have drawn seven of them, and Saturday’s 0-0 at Chesterfield was their fifth goalless away game in the National League this season. The Fylde boss said: “We defended really well against a tough and direct side. It was tough to create chances but we did create two or three, particularly the one for Joe Cardle just before half-time. “The ball bounced just in front of Joe but it was one you’d have to put in the category of a really good chance and one you would expect him to score. “These are the narrow margins, but if we keep on defending as we are then one goal will be enough to win, which is in contrast to seasons gone be. “We could have got the goal in two or three of the games we have drawn 0-0 and that would have given us six more points. The teams will have a quick rematch at Mill Farm on Saturday week after being paired together in the fourth qualifying round for the FA Cup. Challinor added: “It’s a small regionalised draw, so you often get a team you’ve just played or are due to play. They won’t play a lot differently and we know what we need to do. “We know how our players can get more joy against them and open them up. “There’s a big incentive in the FA Cup this season with the prize money being doubled, so it’s very lucrative. First Fylde face Maidstone United this weekend at Mill Farm, having won their last two home games 3-0. Home fans may get their first look at winger Danny Williams, who came off the bench at Chesterfield 24 hours after completing a loan switch from Accrington Stanley which runs until January. Challinor said: “We spoke to Danny in the summer because he could not get himself in the Accrngton team. “He has re-signed for them but hasn’t been playing and he covers several bases for us.